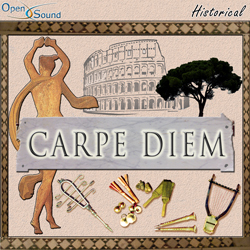 Folkloristic tune by ancient roman reeds and rhythmical tympanum in a cheerful atmosphere. Evocative and melancholic expressions by ancient reeds in a bucolic and pastoral atmosphere. Contemplative and mystical tune. Delicate theme by lyra on light percussion. Rhythmic and solemn march. Ceremonial themes by ancient reeds on a martial rhythm.